Stockholm is by far the biggest city in Sweden, and one of the most important transport hubs in all of Scandinavia. As a result there are excellent connections to the city, both nationally and internationally. Two airports sit within easy reach of Stockholm. 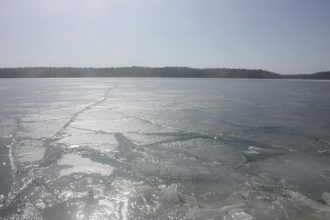 There are also two further airports, Skavsta Airport and Västerås Airport, which misleadingly use Stockholm in their names – note that these are both around 100km from the city. Stockholm Arlanda (ARN) is the biggest airport in Sweden, served by direct flights from destinations across Europe, Asia and the Middle East. The airport also handles flights from around 30 domestic destinations. It’s the main hub for Scandinavian Airlines (SAS). Arlanda is a modern airport with four terminals, bizarrely numbered from two through to five. Domestic flights use terminals three and four, while international flights use terminals five and two. The Sky City shopping area between terminals four and five has everything you might need before or after a long flight, including a pharmacy, hotels, ATMs and restaurants. There’s free wifi across the airport for three hours (or up to 100mb of data) and it’s possible to walk between all of the terminals. 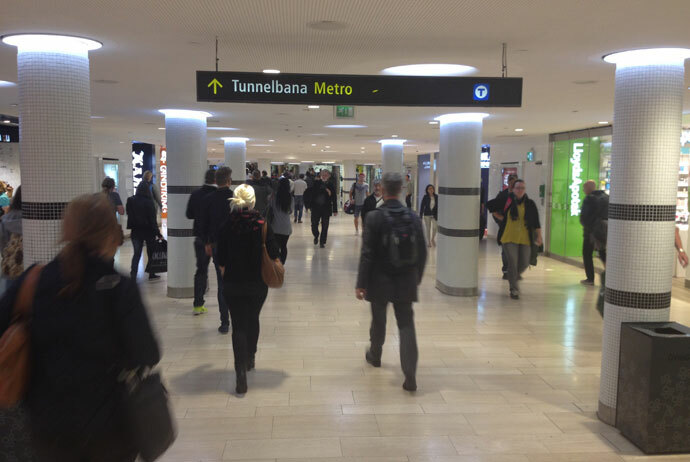 Getting to Stockholm from Arlanda Airport is easy. Dedicated airport buses with Flygbussarna written on the side depart from terminal five every 10–15 minutes between approximately 4am–11pm, taking 45 minutes to reach City Terminalen in Norrmalm. One-way tickets cost around 119 SEK; open returns cost around 215 SEK. Tickets for under 26s and pensioners are slightly cheaper. You can buy tickets online. If you leave it until you arrive, bear in mind that you can only pay with a card aboard the bus – if you only have cash, ask for a ticket at branches of 7-Eleven and Pressbyrån inside the airport. Commuter trains (pendeltåg) run from Arlanda to the Central Station, taking around 40 minutes (around 128 SEK one-way). 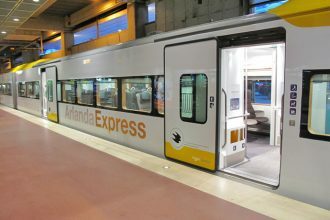 A quicker but more expensive alternative is the Arlanda Express train. This takes 20 minutes to get from terminal two to the Central Station, with departures every 10–15 minutes throughout the day. Singles cost 288 SEK, returns 576 SEK. Youth tickets (for 18–25 year olds) are roughly half the price. Buy before you board, either online or from one of the machines at the airport. Arlanda Express discount codes are hard to come by, but there are sometimes special offers available at the Arlanda Express desk inside the terminal. At the time of writing, it’s possible to get discounted tickets from Thurs–Sun by travelling in a small group of up to four people. The per-person price falls for every extra person that travels in the group, so a couple travelling together would pay 150 SEK each for a single Arlanda Express ticket, while folks travelling in a group of four would pay just 125 SEK each. It’s worth asking about any offers at the information desk before paying full whack. 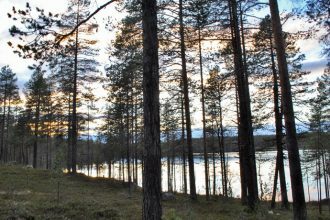 Despite its name, Stockholm Skavsta is actually about 100km southwest of the capital, close to the town of Nyköping. It’s a small-ish airport handling Ryanair and Wizz Air flights from destinations across Europe, including London Stansted and Milan Bergamo. Airport buses operated by Flygbussarna run between Skavsta and Stockholm’s City Terminalen, around 80 minutes away. Traffic can cause delays so allow extra time when you’re travelling back to the airport. One-way tickets cost 159 SEK, open returns go for 285 SEK – both types must be bought with a card (either on the bus or from a machine inside the airport). Alternatively you can book ahead online. 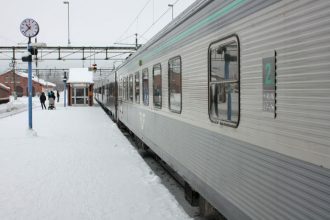 It is possible to take the train from Nyköping to Stockholm but unless there are a few of you, the cost of a taxi to Nyköping’s station (around 200 SEK) would wipe out any savings. 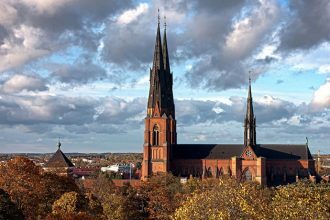 Ryanair flies to Västerås Airport, which is around 100km northwest of the city. It runs direct routes to London Stansted, Malaga and Alicante. Flygbussarna coaches are timed to meet flights and run all the way to Stockholm’s City Terminalen (journey time 75 minutes). Tickets are 159 SEK one-way or 285 SEK open return. As an alternative, you could take a taxi to Västerås station and take a train from there to Stockholm (roughly hourly; journey time one hour). You can check prices and book on the ACP Rail website. Bromma is just 9km from the city centre but serves mostly domestic destinations. At the time of writing it was still operating, though there has been talk of closing the airport permanently. For now there are only a few international routes, from Belgium, Denmark, Estonia and Finland. Facilities are pretty limited: there’s a bar, a restaurant and a hotel. All passengers get free (limited) wifi access. There are two types of bus to help you get to Stockholm from Bromma. Airport buses marked Flygbussarna run to City Terminalen in the centre of Stockholm roughly every 20 minutes from 7.15am–9pm on weekdays. There’s a reduced service at weekends. Tickets cost 85 SEK one-way or 155 SEK open return. Small discounts are offered if you book online, are a pensioner, or are under 26 years old. Cash cannot be used aboard the buses – pay with a card or at the Pressbyrån store within the airport. Public bus 110 (roughly every 30 minutes) also travels from outside the terminal to Alvik, from where you can take the subway into the centre. Note that you must buy an SL Access card from Pressbyrån before boarding (see our section on getting around Stockholm for more). Taxis wait outside. A cab ride to the centre should cost around 375 SEK – confirm the price before leaving. Local commuter trains and services from around Sweden stop at Stockholm’s crowded Central Station, just off Vasagatan in Norrmalm. This station also handles international services from Oslo (Norway) and Copenhagen (Denmark). Spread over three levels, the station can be confusing to find your way around. There are dozens of shops and restaurants throughout the building, and there’s a railway service centre at the southern end of the middle level selling train tickets for onward journeys. A small tourist information counter is close by and hands out free maps. You’ll find luggage storage boxes on the lower and upper levels. Small ones cost 70 SEK for 24 hours or 60 SEK for four hours. Larger ones that should swallow most backpacks cost 90 SEK for 24 hours or 80 SEK for four hours. Wifi is free throughout the station. For train times check ACP Rail (for national and international services) and SL.se (regional services only). Adjacent to the train station is bright and modern City Terminalen, which handles long-distance bus journeys from Sweden and beyond. This is also where you’ll be dropped if you take a Flygbussarna coach from one of the Stockholm airports, or the Viking Line and Destination Gotland ferry terminals. You can buy tickets for all of these buses from machines inside the building. The bus terminal has a couple of useful shops, a tourist information desk, a Viking Line booking counter, toilets and luggage storage boxes (same rates as at the Central Station; see above). Stockholm’s position on the Baltic means that it’s well served by ferries. There are a few different terminals around town. Viking Line ferries run from this relatively central terminal to Åland, Helsinki and Turku (all in Finland). To get there, take public bus 890 to Stockholm Tegelvikshamnen or Flygbussarna’s Viking Line service from City Terminalen. The majority of Tallink Silja Line services (to Helsinki and Turku in Finland and Tallinn in Estonia) stop at Värtahamnen, a few kilometres northeast of the city centre. The subway station at Gärdet is a 10–15-minute walk away from the terminal. Tallink Silja Line uses this terminal northeast of the city centre for its services to Riga. Take the subway to Gärdet (a 1.5km walk from the terminal) or public bus 1 or 91 to Stockholm Frihamnen. A 50-minute drive south of the city, the port of Nynäshamn handles Polferries to Gdańsk (Poland) and Destination Gotland services to Visby on the Swedish island of Gotland. Stena Line also runs a service from here to Ventspils in Latvia. The terminal is served by Flygbussarna coaches from City Terminalen and cheaper commuter trains from Stockholm Central Station. At the time of writing there is no ferry from Stockholm to Copenhagen. If you’re keen on covering at least part of the journey to Copenhagen by boat, your best bet is to take a fast train to Gothenburg and then take a ferry from there to Fredrikshamn (Frederikshavn) in Denmark. So, you’ve landed! 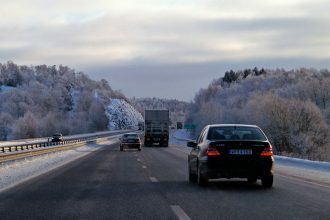 Our guide has tips on the fastest and cheapest option for getting from Stockholm’s Arlanda Airport to the city centre.